Newport Gwent Dragons coach Kingsley Jones says he is in favour of staging 'Judgement Day' again this season. The double-header of Pro12 derby games at the Millennium Stadium have been held since the 2012-13 season. 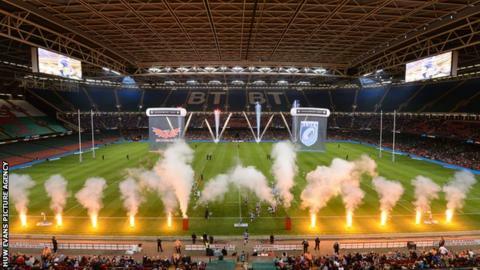 There is no agreement yet to hold the event this campaign, which would see Dragons and Cardiff Blues play their 'home' games at the Millennium. "It's fantastic, it really is... that's a special week, I think for the players they get up for it," Jones said. "Local derbies are always special but to play at the Millennium Stadium I think it's a great idea, a great showcase. "There's 15 guys disappointed [to be left out] today or tomorrow when we name the team, but that week they'll be bitterly, bitterly angry because they all desperately want to play in those games, and that's how you measure it. "I look forward to it. It's a home game for the Dragons, but ultimately it's a big occasion." The event has proved popular, but for the event to take place two of the regions must agree to give up the benefits of a game that would have been played on their own ground. The previous agreement was contained in the old Participation Agreement between the Welsh Rugby Union and the four Welsh regions - Dragons, Blues, Scarlets and Ospreys. But new terms need to be agreed after the Rugby Services Agreement was signed in August, 2014.